Perfectly pairs with Beringer Founder’s Estate Chardonnay. 1. Combine all ingredients for the vinaigrette and mix well. 1. With a melon baller scoop out the bottom of the pear and clean out the core. Thinly shave the pear horizontally on a mandolin. 2. Curl stacks of pears like flowers and place them on a large plate. 3. 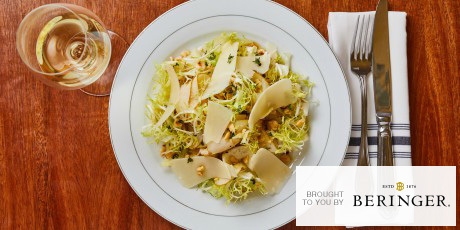 Garnish with frisée, endive, and dress with vinaigrette. 4. Finish with shaved pear and crushed hazelnuts.